From what I've been studying, the measure of the Yugas has been misunderstood for quite some time ... perhaps for thousands of years. 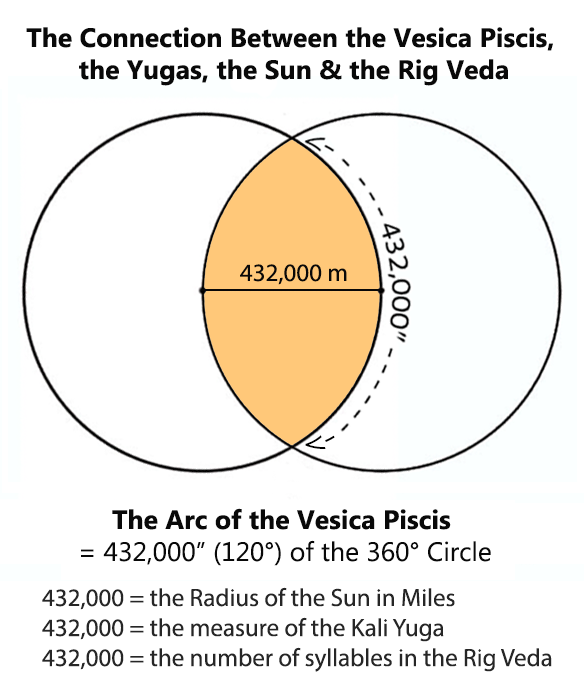 Ms. Norelli-Bachelet teaches that the figure for the yuga (432,000) was never meant to be understood in terms of years, but in terms of seconds of degrees of arc in the 360 degree circle. 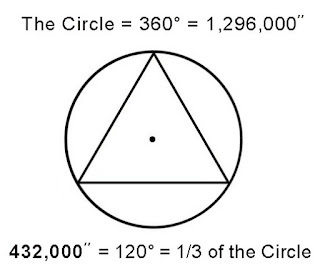 432,000 seconds of degrees of arc equals ONE THIRD of the 360 degree circle. Thus, the sacred measure of the Yuga (which is also the measure of the radius of the Sun in miles) is known as a measure of the Earth’s 360° Precession of the Equinoxes, in harmony with the 12 astrological ages. 432,000″ = one third of the Precession = 4 Astrological Ages. Note that the measure of the Ages in this ancient system of measure is 2160 years, and that 2160 happens to be our measure of the diameter of the Earth’s moon in miles. These correspondences between measures of Time and Space should give the modern mind pause to consider how such ‘coincidences’ came to be, and what is the significance behind such coincidences. People do not normally stop to notice or think about why the 360 degree measure of the Circle, shows up in the measure of our Sun (360 x 1,200 mile radius), Moon (360 x 3 mile radius) and our Earth (360 x 11 mile radius) as well as the measure of the Yugas/Ages. Being multiples of 360, these important measures are also naturally multiples of both 9 and 12. It is a wonder that few take the time to wonder about. 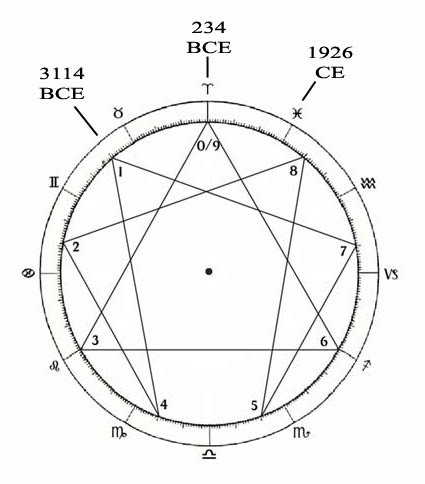 So if these connections are SEEN, then the Vedic Yugas are known are measurements of the Earth’s Precession, calculated in terms of the 12 ages of the Zodiac and in terms of the Circle of 9/0 (of which the circle of 360° is just an expansion). The Gnostic Circle (1976) by Ms. Norelli-Bachelet gives readers a thorough background in these matters and conveys the importance of restoring our civilization’s understanding/knowledge of the spherical and cyclical geometries and dynamics of material existence and time that have been encoded in the Vedas for many thousands of years. 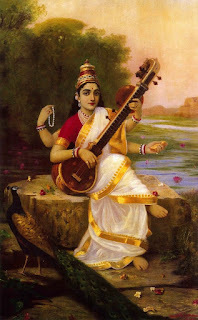 The grand theme that comes across in her teachings is that the evolution of our consciousness and our material experience on Earth includes the evolution of a Supramental Gnosis/Knowledge of Time; and that such knowledge of Time illuminates the connection between our own soul and our 360° journey in Time and Space. Such an illumination must necessarily include a seeing of the real geometries that arise from the ZERO POINT/Sun/Soul and extend into our 360° field of Time and Space … including the geometries of the Earth’s Day, the Earth’s Tropical Year, and our Precessional cycle. Your so welcome, ... Ms. Norelli-Bachelet really deserves the credit. I would have little to NO understanding or interest in these matters if not for her work. Reading The Gnostic Circle at the age of 31 was like entering into a whole new level of understanding of what KNOWLEDGE is (like entering into a true UNIVERSITY). From that point it became clear to me that true knowledge must have true power to Unify and Integrate and Harmonize the whole field, just like the true power of the Sun. I meant to mention to you (and anyone interested in these issues), that Ms. Norelli-Bachelet sees the start of our current Precessional cycle (0 Degrees Aries) as 234 BCE. Meaning the Age of Pisces lasted from 234 BCE to 1926 CE, and the Age of Aquarius began in 1926 CE. 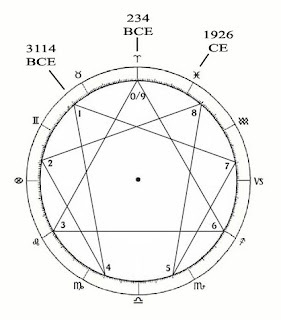 [See 'The New era has dawned'] Several years ago I wondered what the significance of 3114 BCE was in terms of using 234 BCE as the Zero Point of the Precession (Because of the importance of 3114 BCE in the Mayan calendar). Well the span from 3114 BCE to 234 BCE equals 2,880 years. And amazingly it just so happens that 2,880 years is EXACTLY 1/9th (40 degrees) of the Precession of the Equinoxes. I find that to be quite amazing. In terms of seconds of degrees of arc, 1/9th of the Precession, or 40 degrees of the circle equals 144,000". This makes me wonder if the sacred significance of the number 144,000 as it shows up in the Vedas, the Bible, the Mayan Calendar and in various religious or spiritual traditions has been misunderstood, just as the measure of the Yugas has been misunderstood. As 1/9th of the circle, 144,000" is equivalent to ONE integer of our 9 number system. Does this make sense? Just as 1 x 9 makes up the full circle of 9, and 40 degrees x 9 = a full 360 degree Circle .... 144,000" x 9 = 1,296,000" equals the full measure of the 360 degree circle (the measure of 3 Yugas or Treta Yuga). Or in terms of years, 2,880 years x 9 = 25,920 years or the full measure of the Precession of the Equinoxes. 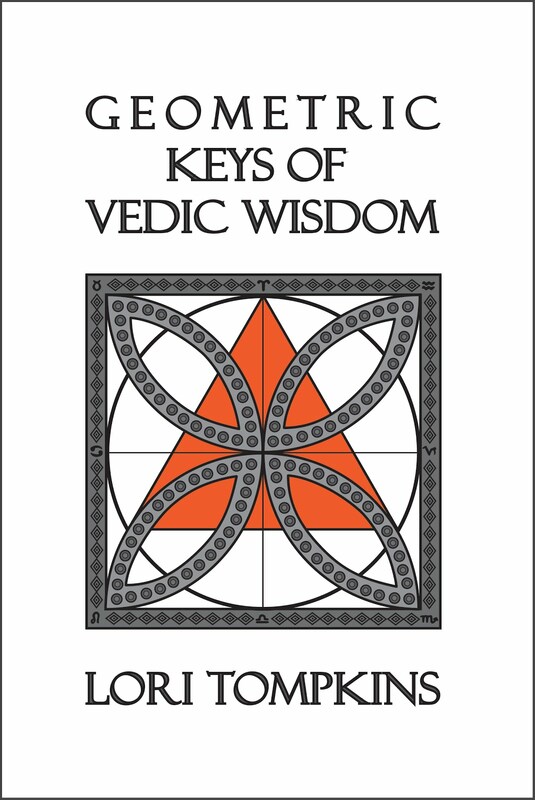 For more information on the circle of 9/0, see 'The Vedic Circle of 9 and 0' and 'The Circle and the Point'. It seems to be an amazing 'coincidence' that 3114 BCE - 234 BCE marks off ONE integer of the Precession of the Equinoxes, especially in light of the fact that the Mayans Ages seem to correspond to 1/5th of the Precession of the Equinoxes (5184 years). Perhaps the Mayans were aware of other divisions of the Circle/Precession. Or perhaps the coincidence has been organized 'Supramentally', i.e. not mentally, but played out in time via the consciousness-forces at work through out the whole journey, regardless of human ignorance. Who is to say, really, how this correspondence/precision regarding the measure of the Mayan Calendar, the Ages of the Zodiac and the beginning of the Great Year as measured from 234 BCE came to be ... but it certainly invites us to take notice of and contemplate the geometry of time. Why Is the Year Divided into 12 Parts?